This service is designed for the new or recently started business that wants to prepare for growth. It will help you to set up a financial structure that works for you right from the beginning or, for those of you already in business, it will help you get control of your business and set you up for profitability. Take the hassle out of getting your books set up – with my personal support and instruction. Do it right the first time, or get it back under control, and your life will be so much easier (and more profitable.) Take the guesswork out of your recordkeeping process. Every new business needs the right advice to get started the right way and that is exactly what you will get! Did you know that the IRS requires you issue a Form 1099 to every non-employee worker to whom you pay over $600 and then properly file that information with the IRS? Failure to handle this properly can create serious issues. I will teach you to do this correctly and will even do it for you for the first year – as part of this package. Smart business owners know that the money is made with their marketing. And when you combine that with solid financial practices that are set up and implemented as discussed in Items 1-3 above, you are on the road to a successful and profitable business. You will receive help developing a simple and actionable marketing and business-building plan to make your business stand out from the crowd and attract customers. I offer two different consulting packages for business owners to choose from. They are differentiated based upon how much time you and I feel is required to maximize the profit our ongoing relationship can generate for you and your company. No matter which level you choose, these packages are for small business owners looking to make more money: the real reason you are in business. The Entrepreneur Package (EP) is for you if you want your company to expand and grow far beyond a simple small business. You have an entrepreneurial mind and you have what it takes to build a bigger business. Once per quarter we are going to sit down face to face and take a ‘helicopter’ look at how your business is working and make sure we are on track to hit your goals. This meeting will not only evaluate progress, it will provide for new ideas and problem solving. Maximum tax savings and problem avoidance. Equipment or other purchases – timing evaluation and strategic optimization of equipment purchases or other large expenditures – from both tax and cash flow perspectives. Timing frequency and payment amount of tax estimate payments. Stay within the requirements while still maximizing cash flow during the year. Advice that is specific to your business and needs. The EP gives you the information and input to keep a firm grasp on what is really going on in your business – and how to position you for even more success. It isn’t enough to have the numbers…you must know which to monitor closely and when to act. It is almost an inevitability. If you have a business, the IRS will occasionally have questions or need clarification. Let’s face it; no one wants to deal with the IRS so let me do it for you. I know what to say, how to say it, how to handle the red tape and the bureaucracy. Even with the best of intentions your books can get a bit off balance. I’ll adjust your year-end financials to match your tax returns, bank statement balances, and loan balances. Being able to create and project cash flow throughout the year is vital. Together we can make projections and increase your cash flow so your business can run like a well-oiled machine. There is a reason for ‘spring cleaning’: Every QuickBooks user (or other account software) can use a quick review of their entries to make sure simple mistakes don’t cause larger expenses. Let me do this for you quickly and accurately so you can stay focused on your business and greater profit. 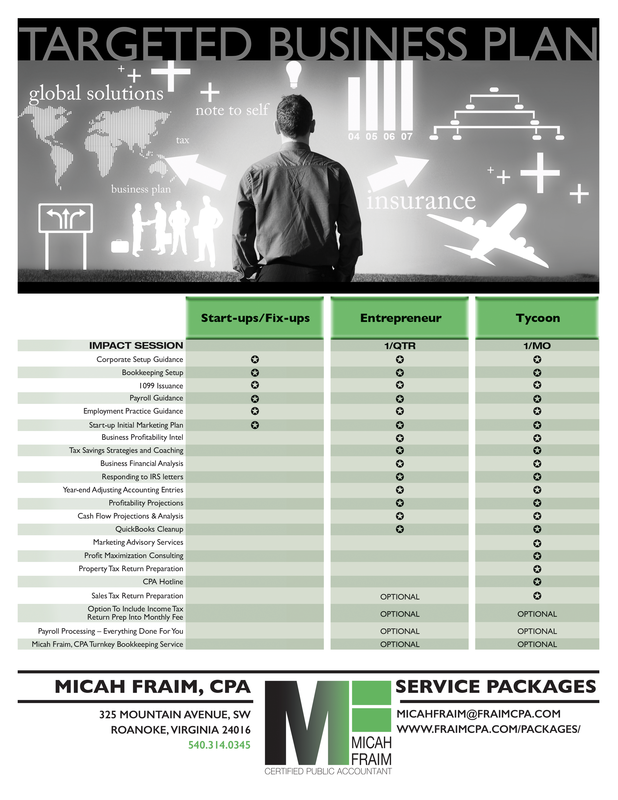 Micah Fraim, CPA turnkey bookkeeping service. This is package is for the serious businesspeople who are looking to build an empire. It all started small, but now you have a substantial, and often complicated business. It wasn’t, and still isn’t easy, but with a business smarts, guts, determination, more hard work than most people would be willing to do, and the right people around you – nothing is impossible for you. With success means more moving parts, more things in motion, and more potential for problems to develop. The larger and more successful you are the more important the finer details and smaller points become in determining your continuous profitability. The difference between saving thousands and losing thousands can be as simple as not monitoring the critical aspects of company finance for a relatively short period of time, and then having to scramble to try to reverse the “negative domino” effect that can occur. Those business owners that choose this package know that frequent professional monitoring of your books and company financial operations your books will maximize cash flow, lock in profitability and eliminate stress and problems at tax time. Is your CPA your most trusted advisor? Maybe it’s time to have your investment in your accounting not only keep you safe from the IRS, but, help you get a real ‘return’ from that most important of business relationships! Once per month we will sit down, review all your goals with a particular emphasis on reviewing expenses and monitoring your marketing efforts and then work through any challenges. Goals that are set, but, not measured and adjusted don’t result in more profits. Smart business owners know that the money is made with their marketing, however, they often forget to detail how they make that money through a written marketing plan. You will receive help developing a marketing and business-building plan to make your business stand out from the crowd and attract customers. Technology is moving fast. And your customers’ needs and demands are becoming more technology-driven all of the time. To be one step ahead of the average business owner you need a deeper understanding of what it takes to bring your business into the 21st Century in terms of marketing, technology utilization, and financial control. We’ll also check in periodically to see how your marketing efforts are going. Based on what has been accomplished, what is working and what is not, and the progression of the marketing plan we will decide which steps you need to take next. A lot of money can be left on the table in any business. We will examine prior year tax returns, analyze budgets and other financial documents to discover any recoverable assets. Additionally, the more frequent meetings and strategy sessions provided at the Tycoon level take the Intel and Financial Analysis process to the next level. Your monthly strategy sessions with Micah Fraim help to identify either problems or opportunities – allowing you to react quickly to solidify your business success. Get direct, personal, VIP access to your CPA when YOU need it. Knowing that you have the direct involvement of our firm in your business as needed via The Tycoon Package means that you are talking to someone who knows your business intimately. It’s like having an expert insider, a part-time Chief Financial Officer at your disposal, without having the large expense of hiring an employee with that level of expertise.